I love the mail! Yesterday I received the package from my partner in the Pringles Can Holiday Swap! I was completely amazed at what a large box that I received. Inside were all sorts of fun Christmas goodies – wrapped! So what was inside? A wonderfully soft and fluffy scarf that my partner’s mother had knitted for me, lots of ornaments including stars, a Santa, candy cane, stocking, and snowman, hand made gift tags, a jingle bell wreath (Taylor would have like to have worn it as a bracelet), a Santa decoration, cookies, a corchet headband for Taylor, ornament hangers, and a small sewing organizer. I’m sure that I forgot something – this was such a haul! This entry was posted in General on November 30, 2007 by stacy. Inside were all sorts of notions – ribbons, elastic, buttons (pin back and sew on), measurement and postcards, and cute little iron on appliques! I’ve already sorted everything out into my notions drawer – now to find projects to use them on! This entry was posted in General on November 29, 2007 by stacy. With the holiday’s right around the corner there have been lots of tutorials, links, and books that have really caught my attention. So, I thought I would share some of my favorites – which means link-y goodness! This entry was posted in General on November 28, 2007 by stacy. This entry was posted in Celebrity Style Watch on November 27, 2007 by stacy. 8 days – that’s all we have until we FINALLY close on our house. After 6 months of construction, living out of boxes, and life in a rental we are just about ready to have our new home! Yesterday’s walk through pinpointed numerous items that still needed to be finished, so hopefully all the work will be completed in time. But enough about that (although be prepared for numerous photos once we take possession) and onto sewing! First off my Amazon order arrived with the Aranzi Aronzo books Fun Dolls and Cute Dolls . Both books come with full size patterns, lots of illustrations on how to complete each project, as well as some basic sewing instructions and tips. If you’ve been thinking of trying out a Japanese sewing book, but have been turned off because of the language barrier – be sure to check these books out, since they are translated in English you can get the same adorable Japanese style but with easy to read instructions! Today, I start my second project using this yummy brown Chenille from Fabric.com. As horrible as this sounds, my goal is to have this finished up before the move so I don’t have to deal with fluffy bits of chenille all over the new house. Now enough of my babbling and onto cutting! This entry was posted in Book Reviews, General on November 27, 2007 by stacy. There’s nothing like the feeling of accomplishment when you finish a project off your ‘to do’ list. For me, that feeling came last night when I completed two aprons and listed them in the shop. After I posted them, I realized – I’ve never made one for myself. I only have a bit more star fabric (which I can no longer find) so at some point, I’m planning on creating one just for me. I’ve been on the hunt for more (or new) star print and after a long search last night, I think I finally found some – Robert Kaufman Pimatex basics. Now to find a store that sells this fabric so I can check out the material first hand. So what’s next? I’d like to say the start of my next project, but I’m sure that I’ll be sidetracked – we do the walkthrough of the house today! Crossing our fingers that we’ll close in 9 days. This entry was posted in General on November 26, 2007 by stacy. I spent some time with my machine yesterday and made a real dent in the apron making. The hardest part is over – making the bodice. The appliques are on, the ‘belts’ are attached, the neckties are set, and the lining is in. I still have a bit more work to go, but they should be up in the shop soon (shameless plug). 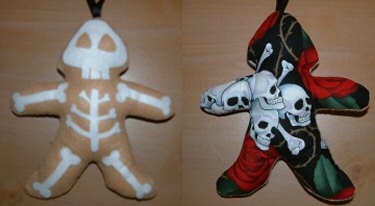 If I have some time, I may make a few skully gingerbread men to add as well! One big project (almost) crossed off my list – one more to go! This entry was posted in General on November 25, 2007 by stacy. I had planned on getting out for a few of today’s doorbusters, Joann, JcPenny’s, and Michaels ads had caught my eye, but we finally had our first snow of winter and it’s just too nasty looking to get out there if I don’t have too. Instead, I’ll spend my time watching the oldest rivalry west of the Mississippi – the KU MU game. Go KU! This entry was posted in General on November 24, 2007 by stacy. Well, today’s post is a bit late – I’m sure you can guess why…. Black Friday shopping! I vowed that I wouldn’t really buy anything, but I managed to find gifts for a few family members and, of course, a trip to Joann‘s brought about a few purchases. I managed to make it there there in time for the doors to open and it was just a feeding frenzy at the flannel section! I found 3 prints that I really liked and picked up some penguin printed thermal knit with a coupon. I also (finally) purchased some bias tape makers! After all these years of sewing, I’ve never owned one. I’m excited to give them a whirl as some point – if you’re not sure how to use these little contraptions, be sure to read Purl Bee’s great tutorial! Skipped the shopping, but still want to get in on some Joann fun? Then be sure to enter their $500 online shopping spree sweepstakes. This entry was posted in General on November 23, 2007 by stacy. Now that I know I’m having a boy I definitely need to get one of these viking hats (Bella Knitting’s site is currently down, but you can see more of her work on her blog here) – this chicken viking hat comes in a close second. For those of you who haven’t heard already, Wendy Mullin (author of one of my favorite books, Sew U) has another book in the works Sew U Home Stretch (to be released May 2008). My other favorite author, Amy Bulter has a new release coming September 2008, Sew Baby . What great timing on this one! Burda Style is making an open call to all designers for their Summer In The City collection. I can’t wait to see what great designs are created in this round! This year I’m buying myself a stocking stuffer – A Cuddly Rigor Mortis Gingerbread Plush. You can also find some of her stuffies at your local Hot Topic. This entry was posted in General on November 21, 2007 by stacy.